At Superior Casino, there’s a real incentive to join because new players will receive no less than six bonuses just for signing up to play. 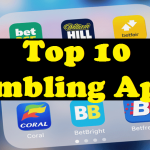 Cracking selection of slots and casino games, making them one of the top casinos which use Rival Gaming software. Games certified by Certainkey Inc which guarantees fair play. 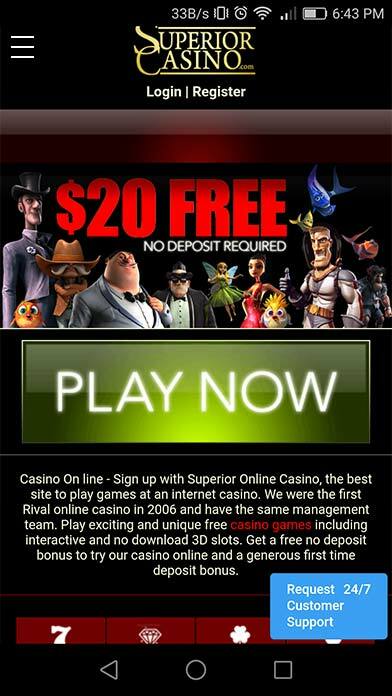 Six free welcome bonuses for all new players including $20 no deposit. Superior Casino is an online casino home to a range of games from Rival and Betsoft. Members will have access to video slots, I-Slots, Video Pokers, Table Games and Live Games. The site can be reached in several languages which include English, French, Spanish, Italian and others and can be played instantly or downloaded. 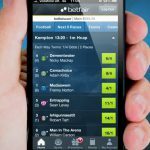 Members can also enjoy the games using their mobile casino. Superior Casino are licensed and regulated under the laws of Curacao. Superior Casino have been in operation since 2003, and have grown to become one of the best casinos which use Rival Gaming software. 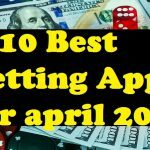 There’s a diverse range of options including download, instant play and mobile gaming plus slots, iSlots and standard casino games such as craps, roulette, black-jack and keno. 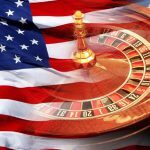 All casinos which use Rival Gaming software have undergone certification to in-dependently prove that the games are fair and not rigged, so despite the more laidback licensing authority, there’s a solid basis to play. Welcome bonuses add up to a potential $5,000 in total and there’s additional weekly tournaments and promos too so there’s lots of chances to win in different ways. 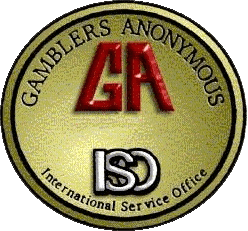 Anyone who needs assistance can use the casinos live chat facility open around the clock, seven days a week. Support can also be reached through email. There’s a further $5,000 on offer in slots bonuses including $1,000 100% 1st deposit bonus, $900 150% 2nd deposit and then three separate levels of reload too depending on how much you’re depositing. There’s a total of $1,000 available in casino match bonuses, starting with $500 as a welcome bonus for the first deposit. There’s a further $300 for the second deposit and $200 for the third deposit too. This bonus has a wagering requirement of 15x(deposit+bonus) for the deposit bonus and 20xbonus for the No Deposit Bonus. The maximum allowed bet is $5 on any single round of play. There is no maximum win on the deposit bonus and the No Deposit Bonus carries a maximum allowed win of $50. Turn those feelings into determination and spend on becoming an achievement! My husband is 65 years old and has brought Type 1 diabetes for 47 long time. We’re a group of volunteers and starting a new scheme in our community. Your site provided us with useful information to paintings on. You’ve performed a formidable job and our entire group shall be grateful to you.